Fr Paul Walsh SM is an Assistant General for the Society of Mary. 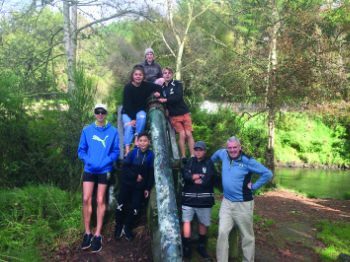 He recently visited New Zealand for the first time and wrote about his time here for the Provincial Newsletter. In writing about his trip he gives a brief snapshot of the works of the Society in New Zealand. This is an edited version of the article . Arriving back in Rome on the 1st May last, after a marathon journey from Auckland via Dubai, my mind and my heart were so full of impressions and thoughts that I knew I would have to write something about my “familiarisation” visit to the Marists in New Zealand – something other than a formal report. Kia ora to all of you confrères and close friends of the Marists in Aotearoa, the Land of the Long White Cloud. I must confess, apart from a few night storms and a couple of overcast days, the sun was more in evidence during my stay with you than were the clouds. 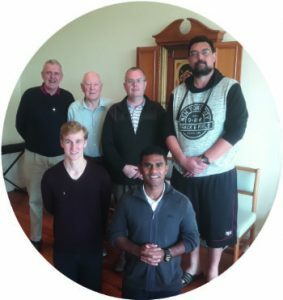 Marist Seminary, Auckland, was a great place to start: the welcome and friendly atmosphere in the community, along with the rich diet of liturgical celebrations throughout the Holy Triduum, were an admirable antidote to jet-lag. I felt a sense of space, of calm, of friendship and a structure of prayer that all made landing in the Southern Hemisphere virtually painless. I also had the pleasure of being greeted in traditional Māori fashion by Bev McDonald (Marist Laity) and Jen Martinez and her team (Logos), with a really inspiring sharing on what it means to engage in Marist mission as Lay People. The few days in Wellington, including the two days of meeting with the Provincial Council, continued in the same vein: a genuinely hearty welcome, fraternal sharing, and well-organised government and administration impressed themselves upon me strongly. I had occasion to meet many of the Marists from the Wellington area at the Pā Maria Marist Spirituality Centre, as well as visiting the newly refurbished St Mary of the Angels church. I also stumbled upon the house where Katherine Mansfield spent her early childhood, as well as exploring the port area, and visiting the Marist Archives, where Elizabeth Charlton showed me around. I spent most of a day with the Marian Court Retirement Community which the Marists share with the Sisters of Compassion, visited St Pat’s Silverstream with Fr John Walls, and St Pat’s Town in company with Br Matt Morris and Fr Pat Brophy, with some fascinating conversations on growing old freely and gracefully, on presence to the young, on finding the appropriate collaborative roles with lay professionals in our schools. I experienced a wonderful reception – welcome, exchange and food – at Marist Challenge House, where Challenge 2000 is now based, with Kitty McKinley and her team. I was also able to spend the best part of the day in Ōtaki with Frs Phil Cody and Peter Healy and Br Denis O’Brien, visiting the soon-to-be-completed refurbishment of the old presbytery and talking about the challenges and opportunities of working with Māori communities. From Wellington I flew up north, to Whangarei Parish, to spend a few days with Frs Chris Martin, Peter McDermott and Trevor Tindall. Actually, I only flew to Auckland, as the combination of a mechanical failure in one plane and the rising wind meant that the turbo-prop journey to Whangarei had to be made by coach. A further opportunity to appreciate the variety of landscape! While in Whangarei I attended the funeral of Sr Margarita SM at Whangaroa, Northland and then spent two days touring the first settlements of Pompallier’s mission – Hokianga Harbour (including praying around the raised casket of the Bishop’s remains) and the Bay of Islands. 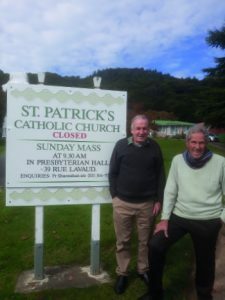 We stayed in Paihia, visiting Russell and Pompallier Mission (a fascinating experience, where Chris Martin and I were encouraged by our Scottish guide to chip in information on the Marists). A friend of Chris’ shouted us a 3 hour commented cruise around the Bay, where it was a matter of honour for our captain to introduce us to two large pods of dolphins. This was my first visit to this part of New Zealand, which is so steeped in history, both Māori and Colonial, a real pilgrimage. L-R: Br Ray Kelleher (RIP), Fr John Allardyce, Br Pius Keene, Br Denis O’Brien, Br Joe Lamb (seated), Fr Arthur Toothill, Fr Barry Scannell, Br Robert Johnsen, Fr David Kennerley, Fr Frank Twiss (seated), Fr Paul Walsh, Fr Michael O’Donnell, Br Bill Archer, Fr Earl Crotty (seated), Fr Tony Williams, Fr Peter Carde. I then returned to Wellington to join up with Fr Mark Walls and his Young Marist team to spend seven days getting to know something of the challenges facing impoverished rural villages and to meet with the leaders and families of some Māori communities. This was a really rich and intensive experience with a group of 15 young people coming from the 7 schools connected with the Marists. The learning curve was steep, the development of friendships rapid. We engaged with the Murupara community, and then with a team of people attached to a Māori primary school and ecological centre in Te Whaiti (Whirinaki forest). In Murupara we hosted the two Fr Davids – Gledhill and Moore – for supper. We were presented with a mind-blowing mythological presentation of New Zealand (Māori) history by Chaz. Chris, Josie and Alfred enriched the educational experience. We had the chance to experience the forest at first hand, as we were invited to help straighten out a dirt road through the forest high above the surrounding countryside. Other parts of the total experience included steeping in hot pools and bathing under a water-fall – not for the faint-hearted. I felt very privileged to be part of this immersion into another world and to share the learning experience with the young people. For me, too, the experience of driving the Desert Road and coming upon Lake Taupo were mind-blowing. A vast country, wild and spectacularly volcanic in its origins. From Wellington I flew to Christchurch, where, again, a gathering of confrères in the parish enabled me to meet most of those working in the region. Fr John Craddock was an impeccable and indefatigable host. Bishop Paul Martin spent a delightful evening with us, whitebait on the menu! I also had the opportunity on two consecutive days, thanks to Frs Allan Jones and Barry Malone, to visit New Brighton and Lyttelton, and also see some of the devastation done to the two cathedrals and surroundings in the Christchurch city centre. And then to Akaroa Parish and Fr Paul Shanahan, who treated us to a lovely lunch by the beach. From Christchurch I flew to Napier, where Fr Michael Wooller looked after me most graciously. Again, we had a gathering of confrères from the surrounding communities, so I had the chance to meet most of them, Michael organising the preparation and serving of a real banquet. While at Maryknoll I met the directors of Marist Holdings, had lunch in the Greenmeadows restaurant, and then had a guided tour of the winery, vineyards and the land intended for housing on the top of the hill behind the house. 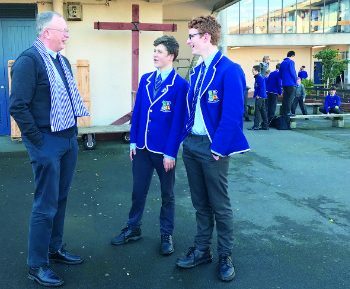 The last leg of my trip was to the Mount Eden community in Auckland, including a short visit to the parish of Manurewa, and a morning visiting Good Shepherd College and meeting the staff there. By that time, I really felt I had some grasp of the range and complexity of our New Zealand Marist Province and some of its works. I was excited, felt very privileged, and hugely encouraged by what I shared with you. I was also very aware of some of the giant challenges you face in the coming years. My prayer for you is that the obvious spirit of fraternal bonding and Marist identity, allied to the creative energy of so many of your projects and of those who work with you in delivering the mission, may combine to provide you with a source of energy, passion and collaborative zeal to write the next beautiful chapter in New Zealand’s proud Marist history. Thank you for allowing me to share this with you in such a wonderful and formative way. I will not forget this trip. I keep you all in my prayer.